The resection of invasive head and neck tumors may result in complex and extensive defects, frequently three-dimensional, or composite defects compromising osseous, muscular and cutaneous strutures. The exposure of vital strutures and the direct communication of the oronasopharynx with the brain demand immediate reconstruction(15,17). One of the surgical approaches is the one-stage transfer of a large amount of well-vascularized tissue through microvascular techniques. Many microsurgical flaps were employed for the reconstruction of head and neck defects. However, the rectus abdominis musculocutaneous flap based on its deep inferior epigastric vascular pedicle(7,18,23,24,26) is one of the most used. TAYLOR; DANIEL(31) in 1975, suggested the rectus abdominis musculocutaneous flap based on the deep inferior epigastric artery. MATHES; BOSTOWICK(22) employed it for the first time in 1977, for the reconstruction of a defect in the abdominal wall. Studies conducted in fresh cadaveres with ink injection, performed by TAYLOR; CORLETT(29) in 1981, demonstrated the posibility of expanding the cutaneous portion of the flap beyond the muscle limit and also towards the site contralateral to the vascular pedicle. HOLMSTRÖM(14), however, has already demonstrated this possibility in 1979, performing the first microvascular transfer of the musculocutaneous portion of the inferior abdomen vascularized by the deep inferior epigastric for breast reconstruction. MARUYAMA; OSAFUNE(21) in 1987, employed the microvascular transfer technique for the reconstruction of a facial defect, using the rectus abdominis musculocutaneous flap based on the superior epigastric vessels. TAYLOR et al. (30) in 1983, and BOYD et al. (4) in 1984, pointed out that the deep inferior epigastric artery and its musculocutaneous perforators contributed more to the vascularization of the abdominal wall than the deep superior epigastric artery. The dominant cutaneous perforators, the terminal branches of the deep inferior epigastric artery concentrate around the umbilicus and present a mainly superolateral course, and anastomose to the terminal branches of the intercostal artery. These periumbilical perforators are the responsible for the flap vascularization, which the authors(30) defined as "the extended deep inferior epigastric flap", with a straight axis linking the umbilicus to the scapular angle. Fig. 1. (Above, in the left) Preoperative aspect. (Above, in the right) Resulting defect. (Below, in the left) Design of the Flap. (Below, in the right) Completely dissecated flap. Despite the innumerable studies on the abdominal wall vascularization(4,10,24,25,29,30), the accurate establishment of the extension of the cutaneous area to be transferred with one of the rectus abdominis muscle is still not possible, for it depends on the muscular size and the perforator vessels inclueded on the flap. The cranial and caudal limits of the flap cutaneous portion is not well defined in the literature. The lateral limits of the extended deep inferior epigastric flap(30) is on the medial axillary line ipsilareral to the vascular pedicle and on the line above the border of the contralateral rectus abdominis muscle. MELAND et al. (23) in 1989, published their experience with the microvascular transfer of 80 rectus abdominis flaps, being 15 for head and neck repair, 62 free flaps for the lower extremities, 2 for upper extremities and 1 for chest wall repair. They stated that the rectus abdominis free flap was the most employed by them, because of the low complication rate, facility in elevating the flap and the presence of a long, large and constant vascular pedicle, represented by the deep inferior epigastric vessels. NAKATSUKA et al. 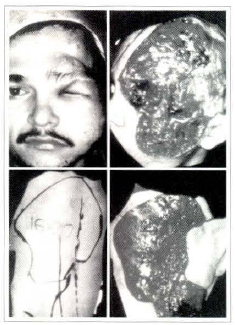 (26) in 1994, presented the highest worldwise casuistry with 200 cases using the rectus abdominis musculocutaneous flap for head and neck reconstruction. The immediate reconstruction was performed after tumoral resection in 194 patients, and 6 patients underwent a later operarory stage. 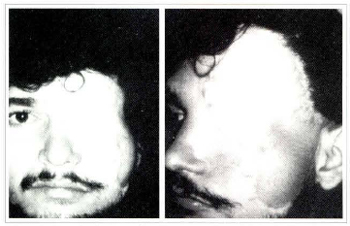 They emphasized the versatility of the flap, mainly concerning its volume, enabling a decrease in the quantity of muscle included on the flap, as well as allowing the defatting of the subcutaneous tissue of the cutaneous portion of the flap in the same operatory stage, in agreement with previous reports by KOSHIMA; SOEDA(19) in 1989 and AKIZUKI et al. (2) in 1993. The aim of this prospective study is to point out the experience acquired from 30 immediate and consecutive reconstruction of complex and extensive defects resulting from head and neck tumors resections, with the use of the rectus abdominis musculocutaneous free flap based on the deep inferior epigastric vessels. Our purpose was to determine the flap surgical anatomy observed during the surgical act, the efficiency of the reconstruction technique, and above all the quality of the results obtained with the procedure. From July 1987 to April 1994, 30 consecutive patients received rectus abdominis musculocutaneous free flaps employing microvascular free transfers for immediate reconstruction of defects resulting from head and neck tumoral resections. The age of the patients ranged from 20 to 80, average age was 52,5 years. Of our patients 19 were male and 11 were female, 29 were white patients and only one was oriental. Tumoral recurrence was found in 17 patients with previous surgical approach, the average number of surgeries was 2 per patient and 10 patients underwent previous irradiation. Histologically, 13 patients presented basal cell carcinoma, squamous cell carcinoma occured in 13 cases, meningioma in 2, sarcoma in one and neurofibroma in one patient. The flap donor site characteristics were as follows: out of the seven patients with laparotomy scar, three presented the Pfannenstiel transverse suprapubic incision for cesarean section, inguinotomy for groin hernia in two patients and Mcburney for appendicectomy in two patients. Tumoral resection was performed under the responsibility of the Head and Neck Surgery staff with the colaboration of the Neurosurgery staff in 21 cases. The defects resulted from tumoral resection are shown on Table 1. Table 1. Neurosurgical procedures, schematic figures of the resulting defect, operative time, hospitalization and ambulatory follow-up period. Flap elevation started simultaneously with tumoral resection, soon after the delimitation of the surgical margins. Whenever needed, the thickness of the rectus abdominis musculocutaneous flap was reduced, through partial resection of the subcutaneous fat distal to the lateral border of the muscle. It was done at the same moment of the transfer, keeping in its entirity the vascular net in the subdermic plexus. This procedure was defined as "immediate defatting" of the flap. Whenever the musculocutaneous portion should be reduced, a muscular area was withdrawn, leaving the lateral and medial thirds of the rectus abdominis muscle on its original site. The immediate defatting of the cutaneous portion of the flap and the preservation of the lateral and medial thirds of the rectus abdominis muscle on the abdominal wall were performed on five and 16 patients, respectively. The selection of the receptor vessels depended mainly on the site of the defect, and vessels exposed to irradiation previously were avoided as much as possible. As receptor arteries, the facial artery was used in 20 patients, the superior thyroid artery in eight and the superficial temporal artery in two cases. The facial vein was the receptor in 21 patients, the thyrocervical trunk in five, the external jugular vein in two, and the superficial temporal in other two cases. All of the arterial or venous anastomosis carried out were end-to-end anastomosed. The whole surgical time, incuding resection and reconstruction ranged from 5 to 28 hours, the average time was 11 hours (Table 1). Patients were discharged from hospital during the 7th and the 49th post-operative period, average day was the 17th (Table 1). Fig. 2. Results 1 year after the expander removal of the scalp. Fig. 3. Intraoperative aspect. Tridimensional extensive defect where intraoral, lateral nasal wall and orbital-zygomatic region reconstruction were necessary. Deepithelization of the flap areas, which are necessary to the flap shaping, are observed. Fig. 4. (Left) Results 3 months p.o. (Right) Tumoral recidive in the naso-orbital region. Nine patients were submitted to irradiation at the site of the tumoral resection, during the first weeks in the post-operarive period. Ambulatory follow-up was carried out with radiologic exams, computed tomography and byopsies for detection of any tumoral recidive. The follow-up period varied from 4 to 64 months, with the average of 26.8 months (Table 1). The results evaluation was based on imrnediate and delayed complications regarding the flap and its donor site, and the quality of repairment, The data was analized by the medical staff and patients. P.C.P., 22 years-old, male, white, from Belo Horizonte - MG, case #5. Patient presented a tumor of the left face since birth, diagnosis of neurofibromatosis, underwent a total of 15 partial resections presenting unsatisfactory result, last surgery in 1981. On 11/21/1988, he was submitted to tumoral resection of the fronto-orbital-zygomatico-temporo-parietal regions associated with left orbit exenternation. The repair was carried out with rectus abdominis musculocutaneous flap with 20 x 16 cm. The vascular anastomosis was performed to left facial vessels. Histology revealed neurofibroma with free surgical margins. Hospital discharge was on the 15th post-operative day. In January 1989, an expander was inserted under the scalp to cover a hairless area in the parietal region. 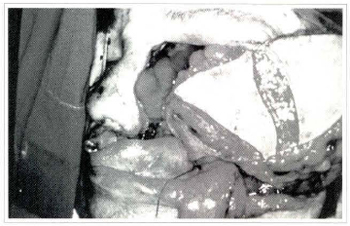 In May 1989, expander withdrawal associated with rectus abdominis flap defatting. No local recidive was evinced during the ambulatory follow-up period until December, 1993. The patient was satisfied with the result obtained, even getting married in 1991. D.F.B., 49 years-old, female, white, from Santa Inês - MA, case # 12. Patient with a ulcerated lesion on the right zygomatic region since 1976. Diagnosis of basal cell carcinoma. Seven surgical resections were carried out due to local recidive. Computed tomography revealed tumoral invasion of the right maxillar sinus. The patient presented a Pfannenstiel cesarean section. On 11/16/1989, tumoral resection of the right nasozygomatico-orbital region associated with orbital exenteration, right radical maxillectomy and oral mucosa resection were performed. The repair was carried out with rectus abdominis musculocutaneous flap, the shape was fusiform with 15 x 10 cm. The anastomosis were done in right facial vessels. The anatomicopathological exam revealed basal cell carcinoma with free surgical margins. Hospital discharge was on the 10th post-operative day. The patient was sent to irradiation afterwards. In April of 1990, a tumoral recidive in the palate was resected together with five teeth and part of the nasal pyramid. In September of 1990, a new recidive in the palate was resected. In November of 1990, a tumoral recidive in nasal dorsum and palate was resected. The repair was done with midline forehead flap and the oral caviry defect underwent edge-to-edge suture. In August of 1991, maxillectomy, tumoral resection in the left infra-orbital region and curettage of ethmoid and sphenoid sinuses. Death occured on 06/10/1992. Intracranial tumoral recidive was also found. The patient could develop her social activities normally and was satisfied with the result. The presence of good quality skin transferred with the free flap enabled the repair of the palate, nasal and maxillary regions after multiple resections for local recidives. Out of 30 transferred flaps, 27 survived reaching 90% of success. In 3 cases (10%), total necrosis of the flap occured, being removed afterwards. The subsequent repairs were as follows: pectoralis major musculocutaneous flap; the radial forearm free flap and the latissimus dorsi musculocutaneous free flap (Table 2). Table 2. Immediate and delayed complications, death and tumoral recidive (related or not to the tumor). Infection and dehiscence of the abdominal wall was observed in one patient (3.3%). After the infection abortion, resuture of the abdominal wall was performed (Table 2). A 79 year-old woman presented total occlusion of the sagital venous sinus due to tumoral invasion in the pre-operative period. In the immediate post-operative period, she rendered comatose and died on the 10th post-operative day. Necropsy revealed cerebral ischemic necrosis. 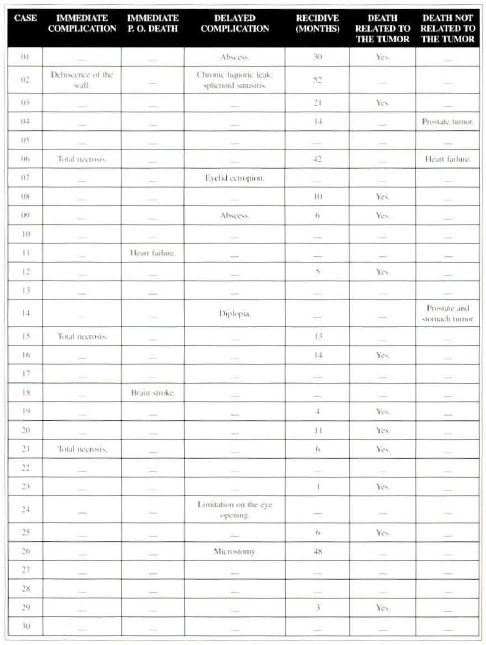 Another patient died on the 7th post-operative day, when she was supposed to be discharged due to myocardial infarction confirmed by necropsy (Table 2). The sole late complication in the donor site was incisional hernia, observed in one patient. Two patients presented abscess along the flap border. Another patient rendered an ectropion of the left lower eyelid due to flap ptosis, partially corrected with defatting and repositioning of the flap associated with full-thickness skin graft for the left lower eyelid. One patient presented diplopia due to disjunction of both medial canthus ligaments during tumoral resection. Diplopia remission was obtained after medial canthoplasty. One patient presented limitation on palpebral fissure opening due to flap ptosis over the upper evelid. This complication persisted even after local surgery. Flap suspension and defatting were insufficient. One patient presented post-operative microstomia and relative impairment of mouth-feeding. Despite the surgical indication for correction, the parient refused it (Table 2). Fifteen patients, 53.5% of the 28 patients followed in the ambulatory, died lately in a period which varied from 4 to 55 post-operative months, average of 18.3 months. In 3 patients, the death reason was not related to the tumor. The death was a consequence of the tumoral recidive in 12 patients and happened in a period which varied from 4 to 38 months, average of 15.4 months. Repair evaluation was carried out in 25 patients. Three patients were excluded due to necrosis of the rectus abdominis flap and so were two patients that died in the immedite post-operative period. A number of 13 surgeries were performed in 9 patients for improvement of results. Flap defatting was done 10 times in 8 patients, skin expander was employed in one patient for scalp repair, and reconstruction of lower lip using the Abbe flap was employed in one patient. The medial staff c1assified 23 patients (92.0%) as satisfactory functional repair and two patients (8.0%) as unsatisfacrory functional repair. The satisfacrory aesthetic repair was obtained in 16 patients (64.0%) and in 9 patients (36.0%), the aesthetic repair was considered unsatisfactory. The patients own evaluation showed tive cases (20.0%) being not satisfactory and 20 cases (80.0%) satisfactory. The rectus abdominis musculocutaneous flap based on the deep inferior epigastric artery presents a long vascular pedicle up to 13 cm of lenght, with constant anatomy and vessels which external diameter range from 2.2 to 3.3 mm at the iliac vessels origin. The similar diameter to cervical vessels enables a quite safe edge-to-edge vascular anastomosis(13). The cutaneous portion is quite large and versatile, being adaptable for the necessity for each repair(30) . The sole absolute contra-indication for the rectus abdominis musculocutaneous flap is the previous surgical section of the periumbilical perforators or the section of the deep inferior epigastric pedicle during abdominal surgeries, mainly the paramedian incision for laparotomy and abdominal dermolipectomy(31). Seven patients underwent surgeries with anterior abdominal wall approach, with no intercurrence. The transverse suprapubic incision during cesarean operation and the cranial detachment of the aponeurosis of the anterior part of the rectus abdominis muscle cause no damage to the main periumbilical perforators, so there is no contraindication for the rectus abdominis muscle free flap. The dissection of the rectus abdominis musculocutaneous flap is easily done, and can be carried out simultaneously with tumoral resection, as no decubitus change is required(18). In out casuistry, the average time for the flap resection is 50 minutes. Based in clinical experience obtained with this study, it is possible to enlarge the limit of the cutaneous portion of the rectus abdominis muscle flap, defined by TAYLOR et al. (30), as far as the longitudinal line at the level of the anterosuperior iliac crest contralateral to the vascular pedicle. The safe transfer of the cutaneous flap portion, supplied by the periumbilical perforators, can be obtained applying the interior of the quadrilateral formed by the medial axillary line ipsilateral to the vascular pedicle, the longitudinal line at the level of the anterosuperior iliac cresr contralateral to the pedicle, the transverse line at the level of the xiphoid appendix cranially and another line joining both the anterosuperior iliac crests caudally. All flaps of this study presented the cutaneous portion enclosed in the above mentioned quadrilateral. No partial necrosis was observed thereafter. The shape and dimension of the flaps were varied, according to each case, pointing out the versatility of the rectus abdominis musculocutaneous flap. Despite the large dimensions, edge-to-edge skin closure was possible in all patients, resulting in linear scars. Although they were placed on a quite visible site and sometimes were widened and hypertrophic, scars were well accepted by the patients. The most serious complication is the complete necrosis of the transferred flap, due to trombosis of the microvascular anastomosis, which must be done with most adequate surgical technique. Previous irradiation to receptor vessels leads to thickening of the wall vessels, ardous dissecation, and technical difficulty when performing the anastomosis. We avoided the use of previously irradiated vessels as much as possible as flap receptors, however, six anastomosis were performed to irradiated vessels. Neither vascular trombosis occured, nor vascular impairment to the flap was observed in any case due to post-operative radiotherapy. Total flap necrosis due to vascular trombosis in three cases were consequent to: one patient had arterial trombosis and two patients had nervous trombosis. During surgical debridement of necrotic tissue, the vascular anastomosis site was explored. No technical error that could have caused vascular trombosis was detected. However, we believe that they were actually consequence of some technical fault. The incidence of 10% of total flap necrosis observed in this study is compatible to literature data concerning microvascular transfers. ACHAUER et al. (1) reported 11.5% of total necrosis after transfer of several microvascular flaps for head and neck reconstruction, CARLSON; COLEMAN5 in 1989, reported incidence of 8.5% of total necrosis in 35 transfers. On previous publications, 4% of total necrosis for cranial base repair was observed in 25 transfers(3). TAYLOR(28) obtained success in 100% out of the 33 rectus abdominis flaps transferred to different anatomical regions, and in only one case, revision of the anastomosis was carried out due to arterial trombosis in the immediate post-operative period. MELAND et al. (23) observed 7% of total necrosis of the rectus abdominis flap in 80 transfers. NAKATSUKA et al. (26) observed 5% of total flap necrosis and 1% of partial necrosis in 200 patients. Several authors reported lower casuistry, varying from one to eight cases with 100% of success(5,7,11,16,18)in the microsurgical transfer of the rectus abdominis musculocutaneous flap for head and neck reconstruction. The incidence of 3.3% of infection and abdominal wall dehiscense was also similar to the literature. NAKATSUKA et al. (26) reported 1.5% of infection and abdominal wall dehiscence. MELAND et al. (23) observed 7.7% of injection and serosanguineous fluid collection in the abdominal wall. COLEN et al. (8) presented a higher incidence, 16.6% of infection in the abdominal wall, probably due to the casuistry of only 6 cases. The delayed complication observed in the donor site was incisional hernia in one patient, corresponding to 3.5% out of the 28 patients followed in the ambulatory. We tried to resect as little as possible the anterior aponeurosis of the rectus abdominis and the aponeurosis ar the cranial portion of the arcuate line, where the posterior aponeurosis can be found. The resulting defect at the anterior aponeurosis was sutured with 2-0 monofilamentar nylon stitches. No synthetic material was employed for abdominal wall reinforcement. The same procedure was carried out by MELAND et al. (23), NAKATSUKA et al. (26) and IZQUIERDO et al. (15) that reported incidence of incisional hernia in 1.2%, 3.5% and 5.5%, respectively. The real function of the muscular portion of the rectus abdominis kept at its original site to avoid the protrusion of the intra-abdominal contents is not well established. HARTRAMPF(12) preconized the sistematic maintenance of the lateral third of the muscle at its original site to colaborate with abdominal wall competence. TAYLOR(28) stated that the innervation of the lateral portion of the rectus abdominis muscle could be preserved during dissection and when kept at its original site, it could also aid in the abdominal wall competence. DUCHATEAU et al. (7), performed an anatomical study on fresh cadaver and demonstrated that the intercostal nerves that supply the rectus abdominis muscle, penetrate into its medial portion and consequently, the remaining lateral portion would be denervated after flap elevation. On a clinical study with computed tomography, progressive fibrosis and even disappearance of the remaining muscular portion was observed due to devascularization and deneveration. They concluded that no motor function of this remaining muscular portion existed and questioned the importance of the remnant fibrosis in abdominal wall competence. The same results were obtained by LEJOUR et al.(20). DINNER(9) also shared the opinion that local fibrosis had low or no importance in preventing incisional hernia. The rectus abdominis muscle is important for the trunk dorsiflexion and abdominal competence(20). The functional sequelae consequent to the use of the rectus abdominis muscle as flap donor is criticised. SHAW(27) pointed out that the functional impairment mainly to professional singers, wind instrument players, athleres and patients with respiratory problems is still not well established with the use of the rectus abdominis free flap and it was also questioned its employment in pregnant-to-be young patients. LEJOUR et al. (20) evaluated the abdominal wall functional after flap transfer and concluded that despite the comfirmed decrease of muscular action based on physiotherapy tests, no significant functional deficit was clinically observed due to synergistic action of external oblique and psoas muscles. CHEN et al. (6) reported 7 gestations and 6 successful deliveries in patients underwent previous rectus abdominis muscle transfers. Bilateral transfers were carried out in 4 pregnant patients, vaginal delivery was conducted in 5 cases. In the present study, no difficulty for dorsiflexion nor any functional limitation was observed consequent to rectus abdominis abscence. The mortality rate of 6.6% during hospitalization can be considered acceptable. TERZ et al. (32) reported 10,3% of mortality rate in 28 patients submitted to tumoral resection in paranasal sinuses. Despite the immediate mortality and complications observed, the highest healing rate is obtained by surgical treatment(33,34) and must be indicated whenever the patient presents clinical condition for surgery and no contraindication is detected. 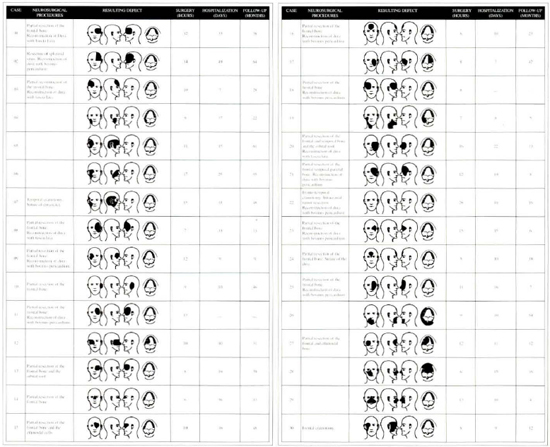 In the evaluation of results, face and flap skin colour mismatch, and poor facial countouring were cause of complaint in 44.0% and 52.0%, respectively. The skin colour mismatch between the face and flap is quite obvious initially, however, ir decreases gradually with time. 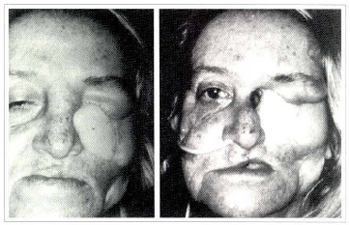 Poor facial countourig was observed mainly in patients who underwent osseous resections. One of the major critics of the rectus abdominis musculocutaneous flap is its thickening, mainly in obese patients. This problem can be partially solved with immediate defatting of the cutaneous portion(2,19) and the maintenance of the lateral and medial thirds of the rectus abdominis muscle at its original site(12). KOSHIMA; SOEDA(19) in 1989, described the possibility of transferring the flap without the muscular portion, dissecating the vascular pedicle, as well as the main perforating branch. This procedure was not carried out in this study, because of the high risk of vascular injury and the possibility of promoting later defatting with minor risks. Flap ptosis and volume excess can be easily corrected on later surgeries such as flap suspension and liposuction or ressection of the fat tissue. The presence of hair on the transferred flap can lead to an unsatisfactory aesthetic result. Patients who underwent post-operative irradiation, lost the hair permanently, achieving a better aesthetic result. However, no recourse is available for those who underwent no irradiation at all. The improvement of local conditions after the surgery such as suppression of pain, ulceration, smell and bleeding was stated by 96.0% of the patients. The above mentioned improvement was even more important than the aesthetic result itself for the patients, stimulating their return to social environment thereafter. Microvascular transfers enable immediate repair of defects of any extension and consequently, tumoral resection can be larger and more radical, increasing surgical indication. An important factor for surgical success is the integration and interaction among the participating medical teams, discussing the best options for treatment to achieve satisfactory functional and aesthetic results and mainly to improve the survival rate and life quality of patients. 2. AKIZUKI, T. HARII, K.; YAMADA, A. - Extremely Thinned Inferior Rectus Abdominis Free Flaps. Plast. Reconstr. Surg. 91:936-41, 1993. 3. BESTEIRO, J. M.; AKI, F. E.; FERREIRA, M. C., MEDINA, L. R.; CERNEA, C. - Free Flap Reparaction of Tumors Involving the Cranial Base. Microsurgery, 15:9-13, 1994. 5. CARLSON, G. W; COLEMAN III, J. J - Microvascular Free-tissue Transfer - The Atlanta Veterans Administration Medical Menter Experience. Arch. Surg. 124:438-40, 1989. 7. CHICARELLI, Z. N.; DAVEY, L. M. - Rectus Abdominis Myocutaneous Free-Flap Reparation Following a Cranio-Orbital-Maxillary Resection for Neurofibrosarcoma. Plast. Reeonstr. Surg. 80:726-31, 19878. 9. DINNER, M. I. - Innervation of the rectus abdominis muscle: implications for rectus flaps. (Discussion). Plast. Reconstr. Surg. 82:228,1988. 10. GOTTLIEB, M.E. ; CHANDRASEKHAR, B.; TERZ, J.J.; SHERMAN, R. - Clinical applications of the extended deep inferior epigasrric flap. Plast. Reconstr. Surg., 78:782-92, 1986. 13. HOBAR, P.C., BARTON Jr., F.E. - Head and Neck II: Reparation (Overview). Select. Read. Plast. Surg., 6:1-37,1990. 14. HOLMSTRÖM, H. - The free abdominoplasty flap and its use in breast reparation. Scand. J. Plast: Reconstr. Surg., 13:423-7, 1979. 15. IZQUIERDO, R.; LEONETTI, J. P.; ORIGITANO, T. C.; AL-MEFTY, O.; ANDERSON, D. E.; REICHMAN, H. - Refinements using free-tissue transfer for complex cranial base reparation. Plast. Reconstr. Surg. 92:567-74,1993. FISHER, J.; MATAR, S. A.; POE, D. S. - Management of large dural in skull base surgery: An update. Laryngoscopy, 100:200-2, 1990. 17. JONES, N. F. - The contribution of microsurgical reparation to craniofacial surgery. World. J. Surg., 13:454-64, 1989. 21. MARUYAMA, Y.; OSAFUNE, H. - Free vertical abdominal fasciocutaneous flap. Br J. Plast. Surg., 40:27-30, 1987. 22. MATHES, S. J.; BOSTWICK II, J. - A rectus abdominis myocutaneous f1ap to repair abdominal wall defects. Br. J. Plast. Surg., 30:282-3, 1977. 23. MELAND, N. B.; FISHER, J.; IRONS, G. B.; WOOD, M. B.; COONEY, W. P. - Experience with 80 rectus abdominis free-tissue transfers. Plast. Reconstr Surg., 83:481-7, 1989. 24. MILLOY, F.J.; ANSON, B. J.; McAFEE, D. K. - The rectus abdominis muscle and the epigastric arteries. Surg. Gynecol. Obst., 293-302, 1960. 26. NAKATSUKA, T.; HARII, K.; YAMADA, A.; ASATO, H.; EBIHARA, S. - Versatiliry of a free inferior rectus abdominis flap for head and neck reparation: analysis of 200 cases. Plast. Reconstr. Surg., 93:762-9,1994. 27. SHAW, W. W. - Deep inferior epigastric free flap for breast reparation after radical mastectomy. (Discussion). Plast. Recontr. Surg., 76:459-60,1985. 29. TAYLOR, G. I.; CORLETT, R. J. - The vascular territories of the body and their relation to tissue transfer. Plast. Surg. Forum., 4:113-8, 1981. 34. ZUKER, R.M. ; MANKTELOW, R.T.; PALMER, J.A. ; ROSEN, I.B. - Head and neek reparation following resection of carcinoma, using microvascular free flaps. Surgery, 88:461-6, 1980. I - Assistant Doctor, Hospital das Clínicas da Faculdade de Medicina da Universidade de São Paulo.